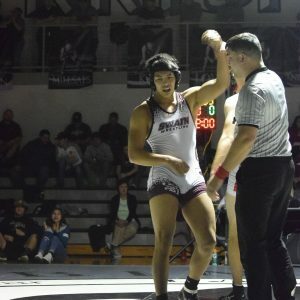 Robbinsville – Damian Lossiah won the 170 pound weight class at the NCHSAA Western Regional Wrestling Championships Saturday. Lossiah was also tabbed Western Regional Most Outstanding Wrestler, along with River Griffith from Avery. For the tournament Lossiah won all of his matches with pins. In the opening round Lossiah defeated Brandon Esparza (East Wilkes). He followed that by downing Eli Marlow (Union Academy). Then in the semi finals he defeated Kody Blevins (Alleghany). In the championship he pinned Joseph Becker (East Surry). For the season Lossiah is now 31-10 and will wrestle this weekend at the NCHSAA State Championships.